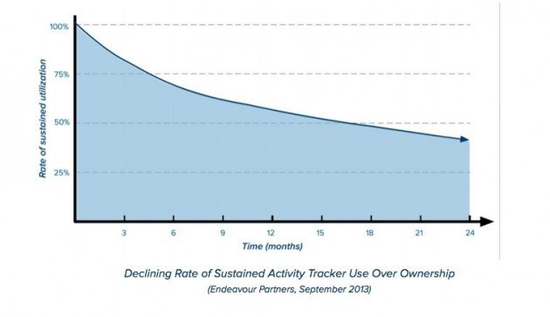 According to a report from Endeavour Partners, "more than half of U.S. consumers who have owned a modern activity tracker no longer use it and a third stopped using the device within six months of receiving it". This trend is symptomatic of a larger problem -- the job that a wearable device does is still unclear to most consumers. This is the crux of the problem I see with wearables, as they exist today. Compare this to today's wearables -- these devices track steps, heart rate, sleep, etc. This could make sense to a niche segment, but how many mainstream consumers know what this data affects them? Also, access to this information isn't really a ubiquitous need. And without habitual use, abandonment is an eventuality. In order to find a ubiquitous use case, OEMs have attempted to replicate smartphone functionality into smartwatches. While this may change the workflow for power users, its value to mainstream users is questionable. The problem is that the smartphone itself has become the go-to device for most user needs -- communication, social interactions, entertainment, information, etc. The very fact that consumers look at their smartphones 125 times a day is a testament to that fact. In order to cater to mass market users, a wearable needs to target a ubiquitous need that is currently unmet. Some observers have suggested that mobile identity and authentication could be that need. The job to be done would be focused and limited -- secure access to all your accounts or payment services, without any passwords. There certainly seems to be an argument for a band or ring that could get this job done. The problem here lies with OEMs -- a simple accessory leaves very little room to make money. OEMs seem to be tempted to stuff these devices with features to reach higher price points (and margins). Of course, this is a view of wearables as they exist today. My opinion would certainly change if developer innovations (via HealthKit or Google Fit APIs) find other ubiquitous needs. But I have to wonder if this requires a new breed of developers.